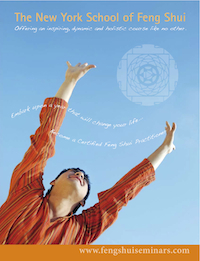 Our curriculum is considered the longest running Classical Feng Shui training in the west, and the most internationally recognized practitioner course. We supply comprehensive workbooks for each module as part of the training fee. We offer reasonable rates and payment plans. Your investment in this program will be repaid many times over. We supply comprehensive workbooks for each module as part of the training fee. You pay no extra fees for attending any of the optional in-house trainings. Online students receive a password to view a complete recording of each 4 day module. You have approx 1 month to view each module, before the next one starts. Each 4 day module is available approx every month to view. You will be emailed the coded link. Online students are welcome at any stage to attend any modules in NYC. Register now and pay by PayPal for any of our courses. The cost of education is an investment in yourself that will bring continued benefits. . We offer a free, no-interest monthly payment plan to help you fit the tuition into your monthly budget. We recognize that financing an education is a major commitment and we are dedicated to reasonable tuition, payment plans and discounts, so that you can continue your education regardless of your financial circumstance. Payment Plan: We accept Visa, MasterCard and Checks, Cash or Money Orders and payments with paypal. You simply pay as you go - which means generally spaced over the duration of the course, or which option you have selected, eg 6-, 8-, or 10-months plans. To register for any of our modules: Email your intention to attend along with name, address, email and phone contact, at least one month before course commencement or sooner or complete this form. For more information about the payment plans, course descriptions or any other questions, send an email to info@fengshuiseminars.com. Full refunds are granted to students in the event the program is cancelled. In the unlikely event of this happening, students will be notified as early as possible and all funds returned. Full refunds are granted to students who discontinue their enrollment prior to the program beginning, minus a $600 non-refundable deposit/registration fee. If the student withdraws or discontinues their participation in the program once it has commenced they will receive course credit for up to two years, if the program is available, which is the school's decision and not guaranteed. No refunds are available once the course begins for either full payment or payment plan students. Students on payment plans will need to sign our basic contract, where they commit to all scheduled payments.